Video interviews, panel discussions, articles and Q&As featuring exact match domain. Rand Fishkin, founder of Moz.com and SparkToro.com, and one of the top 5 SEO experts in the world, explains the value of domains as marketing tools. We discuss EMDs and SEO today, SEO for new gTLDs, how to deal with blacklists or shadow banning, and how voice and mobile search may affect domain name values. All buyers trying to discern the true marketing or SEO value of domain names will benefit from watching this show. What do you get when you combine a killer, three-character exact-match domain name with the assets of a software-as-a-service invoicing provider? A quick path to generating revenue. That’s what today’s Sherpa did, combining a $130,000 domain name with a $20,000 asset purchase. And they were up and running, with some customers saying the brand is so familiar they think they’ve used them in the past. One year into operations, Due.com is processing about $60 million per month in transactions. Here’s how it happened. Should you buy a killer, exact-match domain name and build a business? Or should you stick to the business of investing in domain names? If you want to know what goes into running a business—with employees, inventory, shipping/receiving and customer service—this is the show to watch. And what better exact-match domain name to take on the $15 billion North America ($62 billion worldwide) battery market than Batteries.com. If you’re a startup entrepreneur wondering how a category-defining domain name can help your business grow, you need to watch this show with David Ciccerelli, co-founder and CEO of Voices.com. In this show, Ciccerelli relates how he purchased Voices.com for only $5,000 cash up-front (using a credit card advance), and how the domain was instrumental in building the $15 million business that exists today – so you can see that even without extensive resources, a deal is possible for a great brand and domain name. He also discusses one of the most important benefits of an exact-match domain – instant credibility with customers and media companies – as well as provides some fantastic candid business advice. It’s a must-watch show for entrepreneurs. If billionaire entrepreneur Mark Cuban thinks exact-match domain names are worth investing in, shouldn’t you consider them for your business? 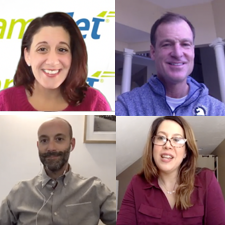 Today’s show features an excerpt from the wildly popular ABC television series Shark Tank, as well as commentary and lessons learned from DomainSherpa publisher Michael Cyger. Instead of hand registering a $9 brandable domain name like ShutterStock.com or iStockPhoto.com and paying for CPC marketing forever, Jon Yau plunked down $250,000 of his family’s savings to purchase StockPhoto.com – a domain name with 50,000 worldwide exact-match searches per month. Yau considers this investment a “pre-payment” for the endless stream of potential customers that visit his website daily through direct navigation. And with plans to continue to grow his photography database, he expects only to increase his customer conversion rate and revenue.